Seed starting… the only way gardeners trick Mother Nature into making spring come sooner, right?? It helps stave off those winter blues and lets us use up some of that early spring energy that always hits us right around February! Can I get an “Amen!”?? Well, I have finally taken the time and done some extensive research that I’m going to share with you on all the ins and outs of starting your own seeds! Seriously, I have pages of notes that I organized into an actual outline (took me back to writing research pages in high school and college!) so that I could give you real, in depth knowledge of seed starting. My own seed starting knowledge is woefully inadequate. I could be the poster child for how NOT to start your seeds! But, I’ve learned a lot and I’m pumped to use some of my own seed starting guide to have a successful seed starting season (I love a good alliteration 😉 ) for my garden this year. Adequately large enough to hold the right amount of seed starting mix. I’ll get more into this in a moment. Must be able to withstand repeated waterings. Your container options range from fancy pre-made seed starting cells, to repurposed yogurt containers. Buying seed starting cell packs isn’t completely out of line. You can sometimes reuse them (although you must disinfect them) and they are sturdy with drainage holes. Repurposing some of your plastic containers is definitely a good option, especially if you aren’t starting more than a few plants. You will need to poke your own drainage holes. I have also used plastic cups, which works well, as long as you remember to poke your own drainage holes! I have also tried those peat pot seed starting cells. The idea is great- when it comes to transplanting, you just put the whole thing in the ground. It’s easier on the plants and definitely makes less trash! But, they had one distinct problem (which I also ran into this observation from others while researching)- they don’t hold up well to repeated waterings. Which makes sense, since they are meant to ultimately dissolve into the soil! Another option that I have seen floating around the internet and seen touted in gardening/homesteading magazines is making your own containers out of newspaper or toilet paper tubes. While I personally have not tried this, my research indicated that this wasn’t a great option unless the seedlings only needed to be in them for a week or two. For plants like tomatoes or peppers that need to be started 6-8 weeks in advance, I’d be leery about how well they would hold up. But, feel free to experiment and if they did start to break down too quickly, you could always transplant them into a sturdier container. Something else that I’ve seen on Pinterest and have experimented with myself is using egg shells or egg cartons. From experience I can tell you that neither one holds enough soil for your seedling to make it all the way to transplanting time! They quickly run out room and then you need to transplant them to a bigger container. Plus I found that they dried out so fast it was difficult to keep up on my watering. You need something to catch the water that inevitably drains out. Waterproof trays allow you the option of watering from the bottom up. You need an easy way to transport all of your seedlings outside during the hardening off period. By far, the best option is something water proof. This could be anything- an old baking pan, a plastic lined cardboard box, a “store bought” plastic seeding starting tray. I highly recommend using something waterproof, because (and I can say this from experience!) a cardboard box won’t withstand all the waterings and draining, lol! An easy way to speed up your germination without an actual greenhouse, is to cover your newly planted seeds with plastic of some sort to create that coveted greenhouse effect. This can be as simple as using plastic wrap over your containers or as fancy as buying an actual cell tray cover. You will be able to reuse a hard plastic cover, so if you don’t mind storing it, this may be a good option for you. If you lack storage space (that would be me! ), then using plastic cling wrap is a great option. The containers only need to be covered until germination occurs anyway. 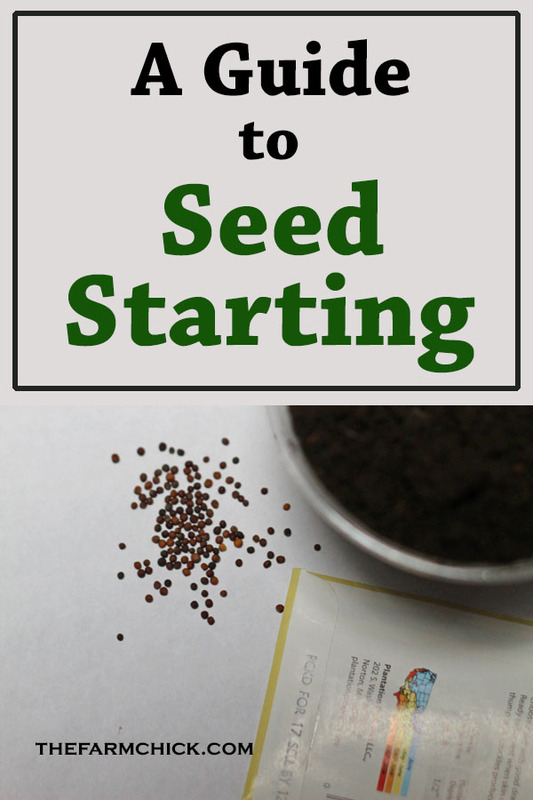 There are several options for seed starting mix and each one will effect the seedling growth in different ways and possibly require other steps to be taken as the seedling grows. Premade mix from the store- This is probably the easiest option and the only one I’ve ever tried. Now, according to a couple different sources, you will need to start fertilizing your seedlings anywhere from 3 weeks to 5 weeks because there is typically not enough fertilizer in the mix to accommodate the seedling from germination to transplanting. (I will get into fertilizer options later). 2. DIY- Now this is where opinions differ across the board! Some say use an even mix (1:1 ratio) of peat moss, vermiculite and compost. With this recipe, you will not need any additional fertilizer before transplanting, but you will need to make sure that your compost is completely “finished” (there shouldn’t be any manure smell to it). You also want compost that is herbicide-free because any herbicide residue can kill your young seedlings. And, to be on the safe side, you should bake your compost at 150 degrees for 30 minutes (until the soil temp reaches 180 degrees F) to sterilize it and prevent the spread of disease to your baby plants. An article I read in Mother Earth News, suggested making a mix of only peat moss and vermiculite in a 1:1 ratio for seed starting. This option does require fertilizer for the seedling later, though. But, the author is a professional who has started thousands and thousands of seeds and maintains that this was the most effective with the best germination rate. There are many, many other seed starting medium recipes. I’m not going to highlight anymore of them, but I encourage you to do your own research if you’re curious 🙂 You might find the perfect recipe that utilizes materials only found in your neck of the woods! This is also optional, but it’s been shown that bottom heat can really help establish root growth, specifically in peppers and tomatoes– which I’m venturing to guess are some of the most common plants that gardeners like to start early. You can use special mats made just for starting seeds, or you can use just a regular old heating pad. One year I used old piglet heating mats that my father-in-law used in his hog operation many years ago! Some gardeners suggest setting your seed starting trays on top of the fridge for extra heat, but I have found that it’s harder to keep an eye on the seedlings because then I need to stand on a chair to see them! The world is your oyster when it comes to buying seeds. You can get them online (some of my favorites are Seed Savers and Baker Creek Heirloom Seeds), at big box stores or use some from fellow gardeners or that you saved yourself! You will also need some sort of lighting set up. I know many places suggest just using a south facing window, but most places in the US will still not get enough light during the winter for that. These seedlings need 12-16 hours a day! Some sort of extra lighting is your best bet. This can be a simple fluorescent tube light, if you have an old one laying around- it does not need to be a special “grow” light. I personally had the best luck with a regular old 4ft fluorescent shop light on chains. Unfortunately, the old fluoresecent lights are hard to come by, but you can use LEDs in their place. You can suspend them from whatever you can find- shelves, make your own little stands, just whatever. Just make sure your height is adjustable. You will need to be able to adjust the height of your light based on your seedlings growth. This is the easy and fun part now! You finally get to get your hands in some dirt- woo-hoo!! OK, so you’ve assembled your equipment, bought your seeds, decided which soil medium you want to use, right? 1. Fill your containers with your seed starting mix. Don’t overpack your containers or cells. Get your mix wet first then fill your containers. Read your seed packet to determine how deep to plant your seed. A general rule of thumb is 2-3x the size of the seed. Use a pencil eraser to push down the seed for good soil contact. Use a meat basting syringe to water after planting (if you chose not to pre-wet your mix). This won’t disturb the seed. DO NOT TURN THE LIGHTS ON YET! Once the seedlings emerge, then you’ll take off your plastic and turn on your lights. Stay tuned for what to do after your seedlings finally emerge. Part 2 coming soon!